Own Marvel Kawaii - Thor Mug from Deff, DVD, Blu-Ray & 4K Video Specialists - Free UK Delivery.. Living happily in a peaceful little village as a humble blacksmith, Thor dreams only of greatness, honour and respect. With legend declaring that he is the son of Odin, the King of the Gods, Thor feels destined to achieve his goals and through fate ends up in control of the most powerful weapon ever created: the Hammer Crusher. Believing he is invincible, Thor and the villagers are shocked when giants crash down and kidnap Thor's friend..
Before he ever lifted his mighty hammer...Fantastic journeys beckon from the mysterious nine realms. Places of dark mists and fiery voids. Of winged creatures and giants in the ice. And of the most alluring quest of all - the search for the legendary Lost Sword of Surtur. Hungry for adventure, Thor secretly embarks on the journey of a lifetime, joined by his loyal brother Loki, whose budding sorcery equips him with just enough magic to ..
Worlds collide when a powerful ancient enemy threatens to plunge the cosmos into eternal darkness. Now, reunited with Jane Foster (Natalie Portman), and forced to forge an alliance with his treacherous brother Loki (Tom Hiddleston), Thor (Chris Hemsworth) embarks on a perilous quest to save both Earth and Asgard from destruction.Special Features Marvel One Shot: All Hail The King, Featurette - A Brother's Journey: Thor & Loki, Exclusi..
From the Studio that brought you the #1 Super Hero movie of all time, Marvel’s The Avengers, comes another must-own, epic blockbuster starring Chris Hemsworth as The Mighty Thor. Worlds collide when a powerful ancient enemy threatens to plunge the cosmos into eternal darkness. 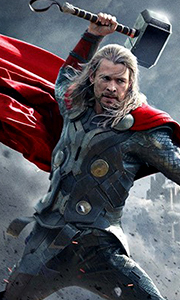 Now, reunited with Jane Foster (Natalie Portman), and forced to forge an alliance with his treacherous brother Loki (Tom Hiddleston), Thor embarks on a perilous p..
Own Thor - The Hammer Of The Gods DVD from Deff, DVD, Blu-Ray & 4K Video Specialists - Free UK Delivery.. The world has many heroes... but only one is a god. When the arrogant warrior Thor (Chris Hemsworth, Star Trek) is banished to Earth from his homeworld of Asgard, he must fight to reclaim his lost powers. Pursued by an invasion force sent to destroy him, the fallen God of Thunder must rise to the battle and learn what it takes to become a true hero. Natalie Portman (Black Swan) and Anthony Hopkins (Beowulf) also star in the blockbuster .. The great halls of Asgard have fallen silent since a new king has overtaken the throne. His name is Loki, son of almighty Odin, brother to the Thunder God, Thor. Once a powerful trickster - the God of Mischief - Loki now rules a grand kingdom with little regard for its subjects. His only thoughts are focused inward, toward the origins of his own pain and suffering. To quell his torment and to gain the respect he feels he so rightfully d..
"The world has many heroes... but only one is a god. When the arrogant warrior Thor (Chris Hemsworth, Star Trek) is banished to Earth from his homeworld of Asgard, he must fight to reclaim his lost powers. Pursued by an invasion force sent to destroy him, the fallen God of Thunder must rise to the battle and learn what it takes to become a true hero. Natalie Portman (Black Swan) and Anthony Hopkins (Beowulf ) also star in the blockbust..
Thor RagnarokSpecial Features Play Movie With Director Taika Waititi's Intro, Featurettes, Gag Reel, Team Darryl (Spoiler Alert), Marvel Studios: The First Ten Years - The Evolution Of Heroes, Deleted Scenes, Audio Commentary..
Own Thor Ragnarok DVD from Deff, DVD, Blu-Ray & 4K Video Specialists - Free UK Delivery..
Own Marvel Retro - Thor - For Asgard Mug from Deff, DVD, Blu-Ray & 4K Video Specialists - Free UK Delivery..
Own Marvel Retro - Thor Panels Mug from Deff, DVD, Blu-Ray & 4K Video Specialists - Free UK Delivery..
Own Thor And Loki - Blood Brothers DVD from Deff, DVD, Blu-Ray & 4K Video Specialists - Free UK Delivery..
Own Thor Ragnarok 3D Blu-Ray from Deff, DVD, Blu-Ray & 4K Video Specialists - Free UK Delivery..
Own Thor Ragnarok Blu-Ray from Deff, DVD, Blu-Ray & 4K Video Specialists - Free UK Delivery..
Own Thor Trilogy 1 to 3 Movie Collection Blu-Ray from Deff, DVD, Blu-Ray & 4K Video Specialists - Free UK Delivery..
Own Thor Trilogy 1 to 3 Movie Collection DVD from Deff, DVD, Blu-Ray & 4K Video Specialists - Free UK Delivery..